· Seven colors are selectable by toggling the switch. 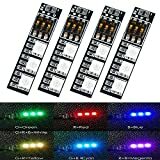 · This LED board will give an eye-catching effect to your multirotors and planes when turned on. · Suitable for multirotor, Helicopters, Cars models and other light DIY.